Anyway, with the holidays and all, we can perhaps be forgiven for having a bit of a slow week. Weeks do get slow Caromble!-wise easily being part-time developers and all. It just takes a single day of being a bit under the weather, and boom no productivity for a week. Especially in the Holiday season that means that things can get slow quickly. So what did happen… Well we made some progress in our effort to tell the back story of the game. We got a new version of the storyboard, and are working with that. Personally I did some work on the planning towards the final release. Deciding on what will fit in the scope of the game is a continuous and difficult process. As a gamer (which we of course also are) you never know what features, ideas, extra levels and effects didn’t make the cut. You either like or dislike a game. Of course you might have feelings like, ‘this game would be even better with multiplayer’, or great level ideas. But that is not the same as missing a feature. You will definitely notice when a game feels ‘off’ or when it simply isn’t fun. Or when it feels rough and unfinished of course. But when it feels good, but could have been even beter… You just will never know. As a developer, your game is never finished. There is always one more level to make. Every effect can be made even nice. The balance of the game could always be tweaked a liiitle bit tighter. There might always be another FPS to be gained on a particular system. So I guess you will always feel like you are releasing something that is in some abstract way unfinished. The witness feels like a perfectly polished game, but who knows how many things Jonathan Blow cut out that we’ll never hear of? So that is our devil’s dilemma. We want to made a great game. We have been going at it for like 8 or 9 years. But we also want to release it. We have made estimates in the past and gloriously missed them, because there was always something more to add. So I guess it is time to end this cycle and finally decide on when will be done. As outsiders correctly assume, indie game-development is a big rollercoaster of rock-and-roll awesomeness. And not at all about staying indoors while the weather is nice and fixing bugs. Not at all. For me, this week’s rock-and-roll awesomeness materialized in the form of euhm several bugs that had to be squashed, while being inside. Hmm. Anyway, sometimes there is awesome stuff and rollercoasters and rock-and-roll. But today it is bugs. Glorious bug fixing. It is a well known fact amongst developers that bugs enjoy laughing in your face. However, most of the times you just know that this must be so, without actually being able to see the bug laughing at you. So when I finally encountered a bug that was literally laughing at me, I wasn’t sure what to think. The problem was that at a certain point in our Prologue, just before the boss releases a power-up its head would make a jump. Just a small one, but annoying nonetheless. I ‘fixed’ that by always animating the head to a ‘neutral’ position before playing a new animation. However, now I head the problem you can see in the gif. The head would sink before starting the next animation… I figured the reason for that *had* to be that some other animation was also adjusting the position of the head. It had to be. Their effects would combine in some sort of unholy way and cause the sinking effect. Haha, I knew what to do! It only took me an hour to carefully tracking which animations where affecting the top of the head of our boss at what time. And then another 30 minutes to come to a slow realization that there was no problem with the other animations. No unholy combination of translations. Just a simple oversight on my behalf. I calculated the translation vector for the head to move back to ‘neutral’, and then instead of applying that, I would animate the head towards the animation vector. To the less mathematically inclined, lets just say that makes as much sense as rotating something by a color. Getting the job done is hard. In just three weeks time we’ll celebrate the 400th Caromble! Friday, and we still haven’t finished the game yet. Admittedly, we are not 100% clear when the first Caromble! Friday was exaclty, but 400 probably isn’t that far of the mark. As some of you are aware, a lot of things have changed in the personal lifes of several of our team members recently (suddenly there are 3 fathers in our team 🙂 ), and those changes are not without their impact on the way we work. We have effectively moved from a team that worked together in a single location (ok, the office was actually a kitchen table, but that still counts), from a team that has to work completely remote. And on unpredictable hours as well. That is not necessarily an easy transition. A lot of things that we got for ‘free’ by being in the same room every Friday are now quite hard. For instance getting time for all the chit-chat that is so essential for productive co-operation is suddenly a thing you have to plan. And the same goes for discussing the little questions you might have when developing. But things are not fun if they are not challenging, so we are happy to embrace all of this unplanned extra fun ;-). We are making a lot of changes to the way we work, so that we may stay productive and at the same time still have fun while working on the game. We try and use productivity tools such as Trello and Gitlab where we can. These tools can greatly structure the discussions you have about various topics. It turns out that Slack is also quite useful, and whatsapp maybe not so much. Another thing that we cannot delay any further is creating a marketing plan to guide us through the final stages of development towards the final release. So indeed, while we have not produced as much visible output as we wanted to at this point, we are still very busy with the game. The first message is of course that Defender will be a new awesome skill level to be included with our next release. And the second one is less literal and shows that we’ll always eventually get the job done. Well in fact only Raymond is larger than life, or at least taller. I (Thomas D) think I’m only just about life sized. The paddle has landed and the PC Gamer Weekender ball is rolling in Londen. Raymond and I have taken our positions at our booth and will be looking to show [i]Caromble! [/i] to as many people as we can. We are looking forward to seeing you as well! Come find us at booth E20. And very hush-hush: we might be selling the game at a discount from our booth. Meet us in London at PC Gamer Weekender 2017! If you’re in London coming weekend make sure to come and visit us over at the PC Gamer Weekender event. Apart from playing Caromble! (awesome) you’ll get a chance to talk to the developers in real-life (super awesome). Get your tickets over here! Thomas and Raymond will be there the whole event to answer all your questions and collect any feedback. So how do you recognize them? 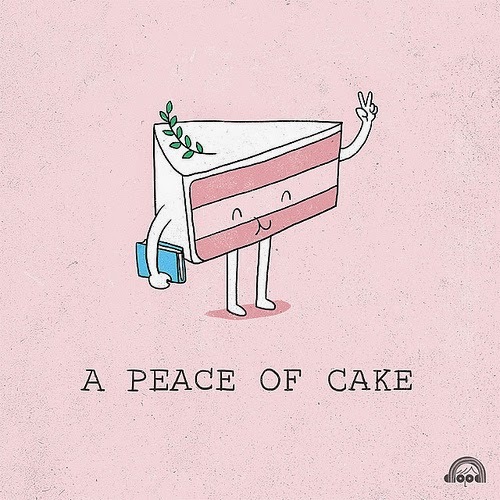 Well that’s easy, take a look at our website! Apart from playing Caromble! there will be many other great games to check out. PC Gamer made a great selection of titles to play. Chapter 4 is coming along nicely as well. This will be the first chapter in our Commercial theme (see below). Caromble! Friday #370 – Tributes to Arkanoid and help from you? Today was my (Pascal here) first of 4 Caromble! Fridays where I will be working all alone . Thomas D. is traveling through Taiwan with his girlfriend. Peter and Raymond have other reasons why they are not here, but I think it’s better if they tell you themselves why this is the case. @Peter and @Raymond: the announcement for next week is for you guys! By removing the plane floor under the ramp, we couldn’t reproduce the issue anymore which pointed us in the right direction. Turns out that our engine did something not quite right when handling collisions with multiple objects over which the ball should roll. Our code sets the speed of the ball directly in this code (overruling the physics engine). Now if the ball collides with 2 of these objects, only the second object has an influence on the ball as it overwrites the speed set by the first object. In case of colliding with both the floor and the ramp, it could be that the floor collision was handled as last, overwriting the effect of the ramp. We now fixed this problem in the current build! I think that this was the last bit of programming I will be doing for quite some time as we need to focus on marketing now. We are programmers (+1 artist) and we are not so much trained in the art of marketing and reaching an audience. However, it is very important to reach an audience as that will result in revenue, which in turn allows us to spend more time in making Caromble! better and perhaps even making a new game after this. 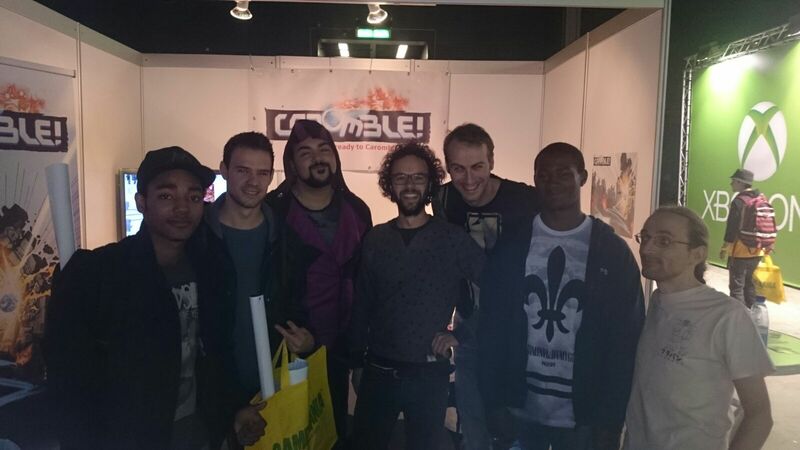 Furthermore, we get happy feelings inside if people play Caromble! and enjoy it, You can make a great game, but if no one has heard of it, what’s the point? So we are focusing on reaching an audience for the coming weeks. It seems that it’s a bit harder to get noticed as an Early Access game. Written press seems especially less interested in that. So we are mostly focusing on youtubers. We hope that this will result in many Let’s Play videos or Twitch streams to reach players that might be interested in Caromble!. Do you have any tips for us to reach players that would like Caromble!? Do you know curators, youtubers, blogs or individual players that are especially interested in brick breakers or Early Access games? Let us or let them know. We can use all the help we can get! 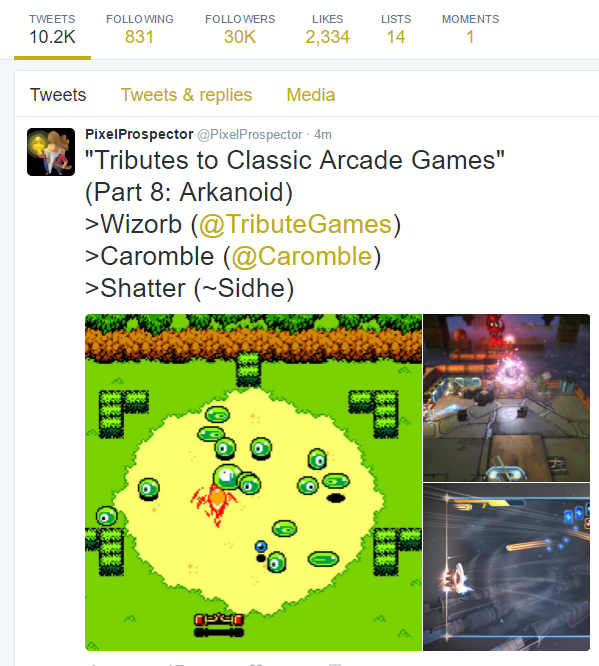 What was nice today is that PixelProspector has mentioned us in a list of 3 games that are tributes to Arkanoid. We are mentioned together with Wizorb and Shatter, which are nice titles to be standing next to. You could help us by retweeting this tweet. As we are nearing the completion of Chapter 3, we are taking care of some gameplay elements that could use some tweaking. For starters, we have tweaked the collision shape of the paddle. It used to be just a box (say what! ), but now it is a composition of 2 cylinders and a box. This makes the collisions slightly more satisfying and aligns them better with the graphics. Although it’s quite funny, we have made sure this cannot happen anymore. These 2 features give a better feeling of control of the paddle and we hope you agree. Let us know if you have any suggestions or feedback after we have released Chapter 3 (including many tweaks, bug fixes, optimizations and a prologue story level). We have made quite some progress today. 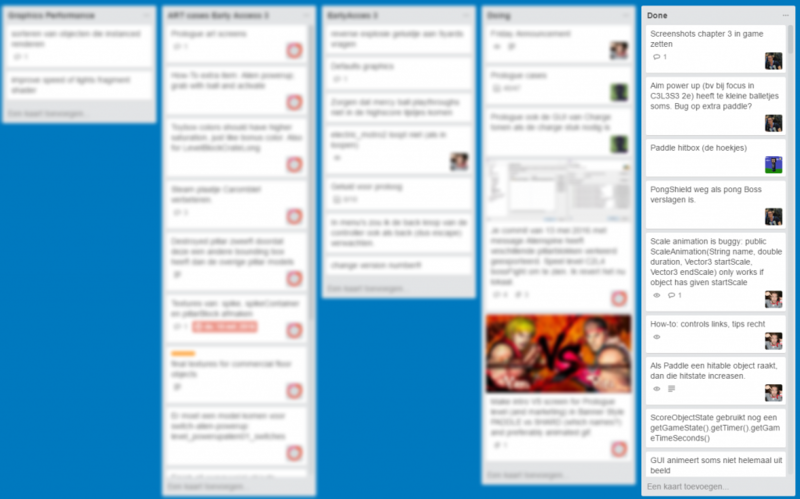 We can see this by looking at our Trello board, which we use for Caromble!. In the following image you can see our favourite list: Done. Today’s completed tasks didn’t even fit on one screen! Firstlook 2015 is over, and my voice almost sounds normal again. Two days of talking about Caromble! with loud music blasting from speakers everywhere did take its toll. But a creaky voice is a very small price for the awesome experience of seeing so many people play and enjoy Caromble!. At times there was even a bit of a crowd around our booth, unfortunately also resulting in a bit of waiting time occasionally. Guess we’ll bring two machines next time. We’ve been on shows before and had plenty of feedback from players on other occasions, but the feeling you get when someone genuinely enjoys the game you made never seems to get old. We also made a picture to prove that marketing is also something that we take very seriously, and that we have been giving our best effort during the Festival. Without any doubt, only a team taking marketing very, very seriously could have made such a picture. And finally a congratulation to Jenfri for winning tickets to Firstlook by writing the best slogan for Caromble! : If it ain’t solid it will Caromble! Op 10 en 11 oktober staan wij met Caromble! op Firstlook in de Jaarbeurs, Utrecht. Als je er heen gaat, kom dan even langs, probeer Caromble! en ervaar brick breaking in de 21e eeuw! De winnaar wint twee kaarten voor de Firstlook beurs in Jaarbeurs Utrecht op 10 en 11 oktober. De beste 5 slogans krijgen bovendien een Caromble! Steam key en een gesigneerde poster. Ook getekend door de artist:). Wat houdt je nog tegen sloganeer als een malle! We zijn benieuwd naar jullie slogans en hopelijk tot op Firstlook! Caromble! is nu verkrijgbaar op Steam Early Access! The post-release buzz has died down a bit, and the pre-next-update release crunch has begun. 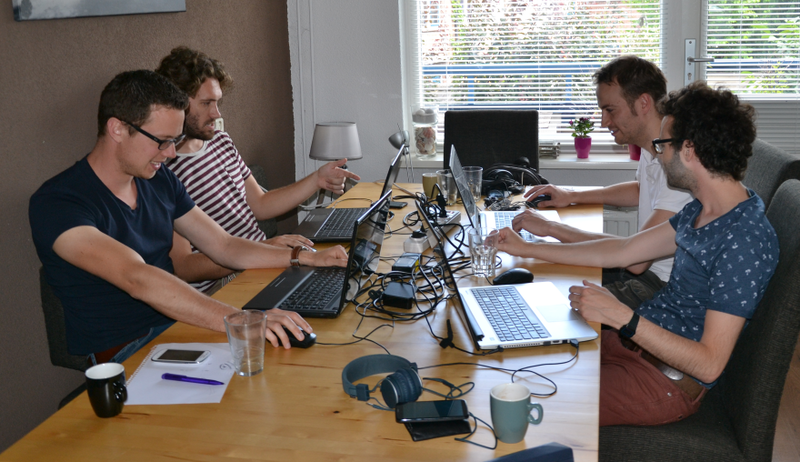 We’re currently working very hard on every Friday to finish the next Early Access update as soon as possible. The big feature is a large overhaul of the input system, so we can have smoother gameplay at low framerates. This has a lot of impact throughout the game, so we’ll have to do some extra thorough testing. Chapter two will be also be part of the next update, effectively doubling the amount of content in Caromble!. Controller support is another big item on the list. And last but not least there will be tons of bug fixes and tiny improvements.